Bangalore-based Deccan Field Agro Industries has large plantations of papaya in Southern India and was looking for the perfect packaging solution to export papaya by sea freight. 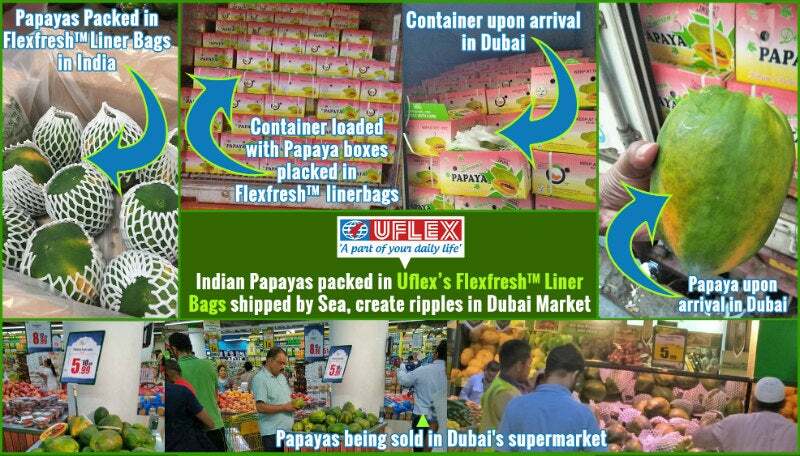 When the company found out that Uflex Ltd offers the appropriate technology and solution, Deccan decided to export the best Indian papayas to Dubai by sea. Uflex Ltd has been offering its active modified atmosphere packaging (AMAP) solutions across the world using Perfotec’s Fast Respiration Meter to determine the respiration rate of the fresh produce, and by using Perfotec’s Laser system to make micro perforations based on the respiration rate, weight and the target oxygen levels for creating the perfect modified atmosphere inside the liner bags manufactured from a special patented polymeric composition. Flexfresh Liner bag by Uflex is the only biodegradable solution that maintains the equilibrium of oxygen and carbon dioxide inside the bag with an added advantage of keeping the product dry without losing weight. Deccan Field and Uflex started the process of testing the respiration rate of papaya using the Fast Respiration Meter and designed the solution for extending the shelf life for up to four to five weeks. Papayas were harvested in the right stage and brought to their pack house. Subsequently, they were sorted and graded as per the stringent requirements of the Export market. Flexfresh Liner bags were placed in the box before placing the papaya. The papayas were prepared as per the Export requirement and a Foam Net was used on individual papayas to avoid any surface injury during transportation. The first 40ft refrigerated container set sail from Deccan Field’s Pack House to Dubai via the Mangalore Sea Port. This container broke several records of its kind, being the first ever container of Indian papayas to be exported, the first container sent from Mangalore port for fresh fruits, and the first container to be received in Dubai only containing papayas. Importing company Southern Star LLC received the container at its cold storage facility during the month of Ramadan. With almost the entire population in Middle East observing fast, the Indian papayas were sent to the market and the entire container was finished within a couple of days of receiving it at Dubai. Supermarkets and fruit wholesalers were extremely happy with the arrival quality of the Indian papayas and Deccan Field further sent additional shipments during the Ramadan period for papayas to reach Dubai. Thanking Deccan Field for its trust and belief in Uflex’s AMAP solution, Mr Siva Shankaran, vice-president of Flexfresh, informed that Flexfresh has been able to deliver freshness for a wide variety of fresh produce both in India and overseas. He also added that customers have started packing in Flexfresh when the supplies are high, in order to preserve the product for longer period of time and release them when the supply is low, allowing them to extend the availability and also reduce their losses. Expressing his total satisfaction on the maiden shipment of papayas from India by Sea Mr CP Yogeeshwara, chairman and managing director of Deccan Field expressed that Uflex has partnered in making this export a grand success with their professional approach and supported them in providing the most optimized packaging solution. He further expressed that Deccan Field is now planning to export other fruit and vegetables such as Bengaluru baby bananas, green chillies, sweet potato, curry leaves, French beans, small onions, Ivy gourd, and drumsticks using Flexfresh liner bags to meet the wide Indian Diaspora residing in the Middle East and also in Europe. All these consignments will be done through sea, he further added. Mr Ashok Chaturvedi chairman and managing director, Uflex Limited expressed his happiness that Uflex is able to offer its superior and optimised packaging solutions to the exporters of fresh produce thereby resulting in higher export earnings and also catering to Indian citizens across the world with their choicest fruits and vegetables. He particularly highlighted the role Flexfresh packaging is playing towards curtailing wastage of food, which is the pressing need of the hour worldwide.